A stock aircraft called Art Deco Drifter. Built with 198 of the finest parts, its root part is structuralIBeam1. Since Im outdated always this car was made in 1.3 so everything onwards could not work on later versions for no reason. Anyway I made this as a drift car to get as much style points. A heavyweight firebreathing muscle car. Driving this might be a bit hard as first since you might often swing your wieght wildly if you try to overcorrect, the key is to use as least amount of inputs to be as smooth as possible. Pitching forward with W helps shift the wieght forward to push you in a turn sharply while pitching back with S helps you regain control as the wieght shifts back. The rear wheels have firmer suspension than the front so the car naturally wants to roll with turns and shifts the weight from side to side to help it get into slides better. Aerodynamic control surfaces and small reaction wheels help give you a bit more control of the balance of wieght on the wheel to manipulate how traction affects the car. There are 8 Juno engines in total with a TWR over 1. 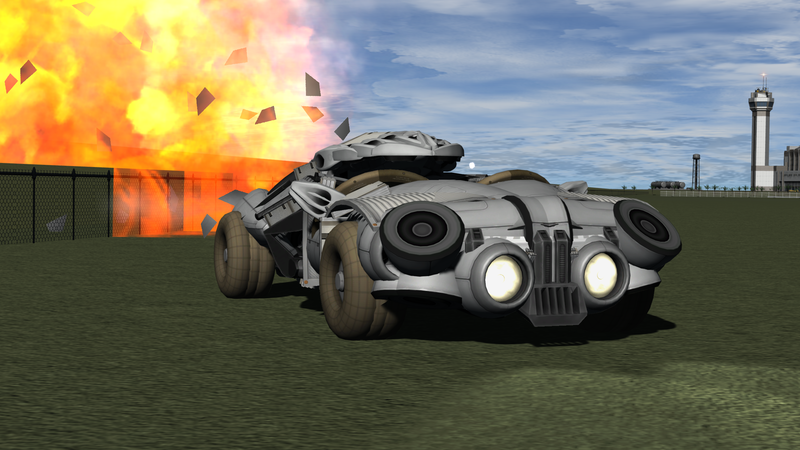 Due to using a large radiator as a building off point for the rear bodywork of the car, the car is rather fragile to strikes on the undercarriege with the ground so dont drive on uneven terrain. Otherwise the car is really hard to flip over and can hold drifts rather well at speeds as high as 60 m/s (althought higher than that and you will slide off the road). When going around your corner control your slip angle to avoid spinning out (holding a input to left or right for too long) or overcorrecting when re-orienting yourself and and accidently going into a second drift. A note to be said that this sort of action is more like powersliding than drifting. In real life cars use traction of the tires with the road or dirt or whatever you driving on to accelerate, steer, brake, and corner. Grip with the ground is a limited resource that is shared with doing all those things and doing one thing too much can cause the wheels of a car to slip and lose traction. Intentionally losting traction in your rear wheels (or sometimes all your wheels) to cause a controlled oversteer though a corner is called drifting. Now how drivers in the real world first of all make it so their wheels lose traction is done in many ways such using a sudden increase in throttle combined with a quick disengagement and rengagement of the clutch to violently accelerate the tires of the car faster than what the grip of the tire with the ground can handle, causing the wheel to lose traction. With this the car then oversteers though the corner turning sharply. If the front wheels point more towards prograde than your rear wheels do, you are drifting. In real life the driver has control over traction of the tires with the ground with the throttle, drivetrain, and brakes to control and manipulate the direction of where the car is going. Countersteer of the front tires where you are turning the opposite direction of the corner you are going through is used to control orientation of the car. A skilled driver can control the speed, angle, and line taken through a corner with manipulation of traction of the wheels. This is the basis of drifting. However ksp physics has none of this and really all we can really do is give ourselves some way to shift weight (since putting more weight on front or back wheels puts more pressure and so more grip) to simulate the ability to control traction of the front and rear wheels as a drifter would. One of the biggest differences between kerbal and real life is that the force that is propelling a car forward is coming from jets and not from traction with the ground itself. You can not clutch kick in this game to get in a slide so instead you need to have a car that has extreme rolling with the suspension to get in a slide and that ends up really unstable to drive thought I tried my hardest to make a car that is easy to control. Another thing is that ksp cars wieght like 12 tons while real life cars wieght 1 ton so yeah. Also drifting in real life is a showman sport and its slower to do than just cornering normally. Unless you are a dirt then the fastest way to corner is drifting due to the fact that the fact that dirt has way less grip than road.